It’s a windy day. There’s this enormous high pressure area moving slowly across the country, centered about the middle of the states, and traveling ESE. Along with it is a 4000-mile-long cold front that stretches from Boluxi to the south tip of Greenland. It’s a big one. Originally we’d planned to be leaving Marathon today, the 24th of March. Our mooring rental runs out today, and we did our final provisioning run yesterday. The boat is nearly ready, with full diesel tanks and lots of propane, and the bottom of Sionna was cleaned by divers yesterday in anticipation. The almost-full water tanks were to be topped off, a last load of laundry done (clean sheets! ), and we’d be away. But it’s blowing 25 mph, it’s rough outside the harbor, and it just seems easier to hang out in Paradise (as the boats that never leave call it) for another day. These are challenging conditions. 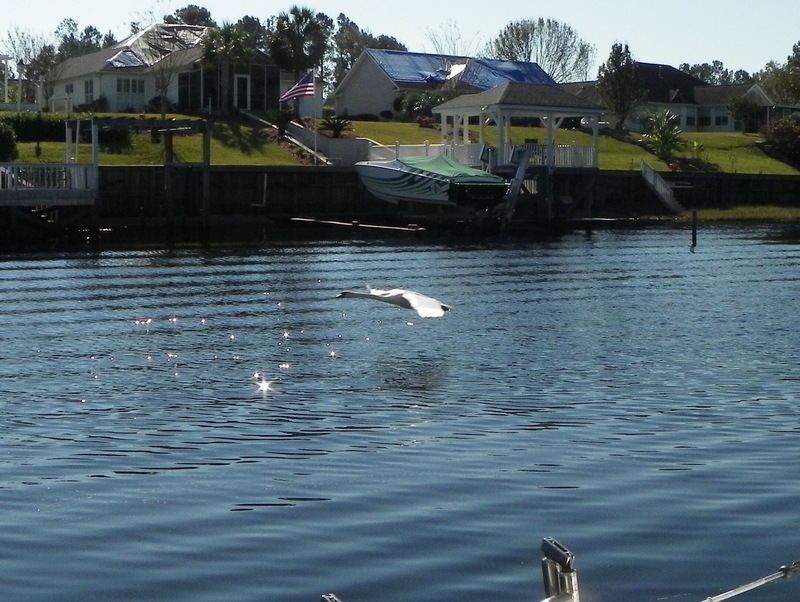 Most folks try to stay aboard their boats in winds like this, just in case… And today “just in case” came to visit. The boat above broke loose from her mooring and began drifting, nobody aboard, playing “bumper-boats” through the mooring field. Our response (Nicki noticed she’d broken free almost as soon as it happened) was to blow the air horn (good thinking, Nicki!) and to get on the VHF radio on channel 16 (the emergency and hailing frequency) and 68 (the local traffic channel) to warn the harbor there was a rogue boat coming (Keith). 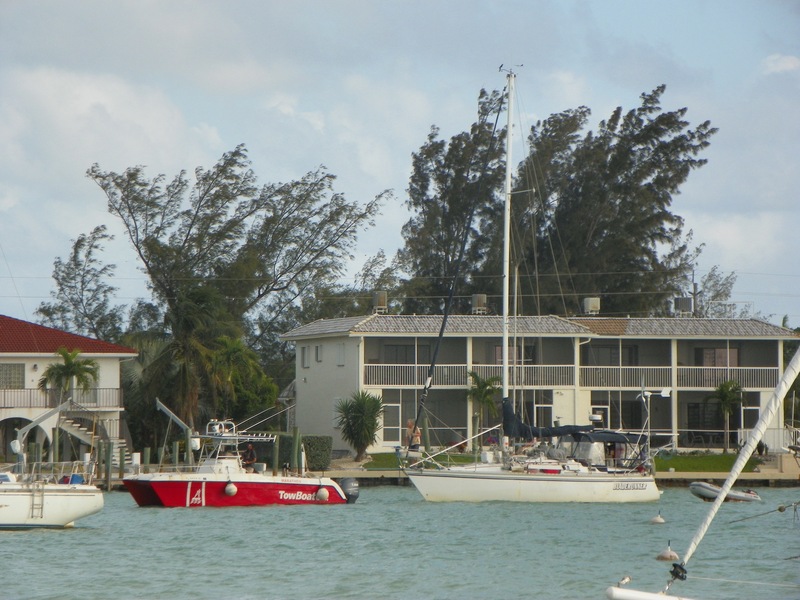 The Marina’s pump-out boat responded, as did several other cruisers in their dinghies, and had old “Blade Runner” corralled in pretty short order – Kudos to all! Cruisers watch out for each other – that’s one of the things I love about this community. 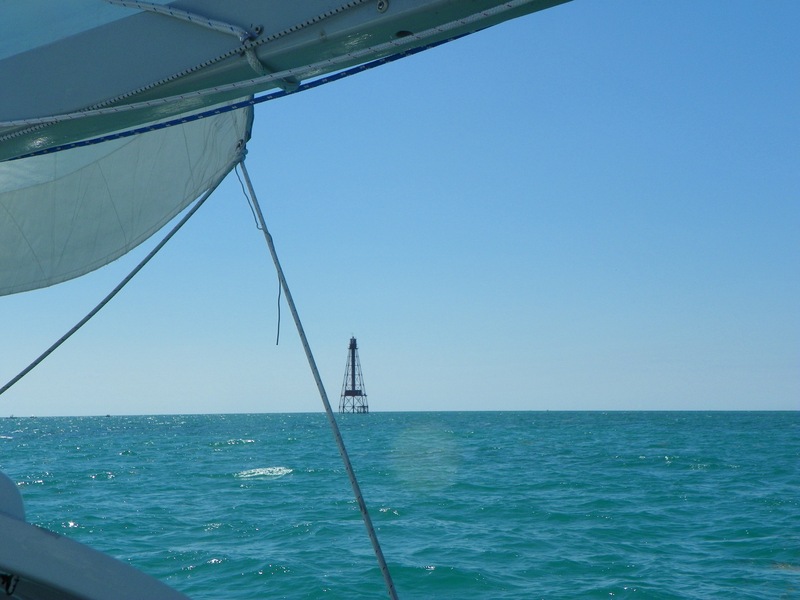 Anyway, tomorrow we’ll finish the laundry and drop the mooring mid-day, heading for Bahia Honda Island first – about 11 miles West of here. Baby steps. Baby steps are appropriate. After two months in one place, we’re not sure we even know how to cruise anymore! To explore, to adventure, to discover… Those and more are good enough reasons, but those can all be accomplished during a 3-week vacation with a guided tour and all meals paid. So why cruise? 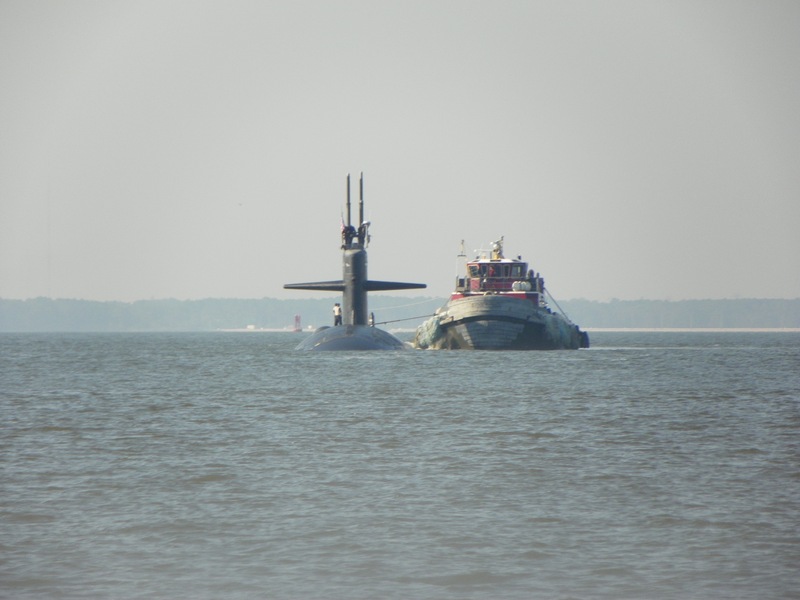 Well, partly because you get to choose your adventures – though being in the middle of a naval towing exercise wasn’t on our list of “things to do” back in Norfolk! But there we were and there they were, so we stayed very still until they let us know where we should go, and everyone was happy – great experience! I think it’s different when you cruise. You’re out there on the water for days, weeks, months even, in places that very few humans get to simply because they don’t have the time. We – like the birds – have nothing but time, and it allows us moments of “Did you see that? !” Far more often than most folks experience. We’ve got (when we get our wish) time to explore, to discover, to adventure. What an incredible gift. We’re finally on a mooring in Boot Key Harbor, Marathon, Florida. The weather continues to moderate as spring happens around us, and temperatures have responded dipping to around 70 at night, low-mid 80’s in the daytime. Our time in Marathon is winding down, and on March 24th our rental of the mooring will run out, pushing us back into cruising mode. I hope. We’ve been sitting still a long time, and poor Sionna’s bottom is becoming a vegetable garden! So with February well behind us, we take a peek at the events (and expenses) that kept the crew and the boat happy during our month’s travels. Here, presented in no particular order, are some numbers that I found interesting from the month of February, 2017 or – where so noted – since we left Rockland In August. Enjoy! 1303 nm (1498 sm) – Miles from Rockland in a straight line. * Nearly 2.5x our January production. Spring is coming! ***A very dangerous “dark money” category. Who knows where it went? Perhaps “hero” isn’t the perfect word here, but it’s pretty close. Well Behan and Jamie are two of mine. 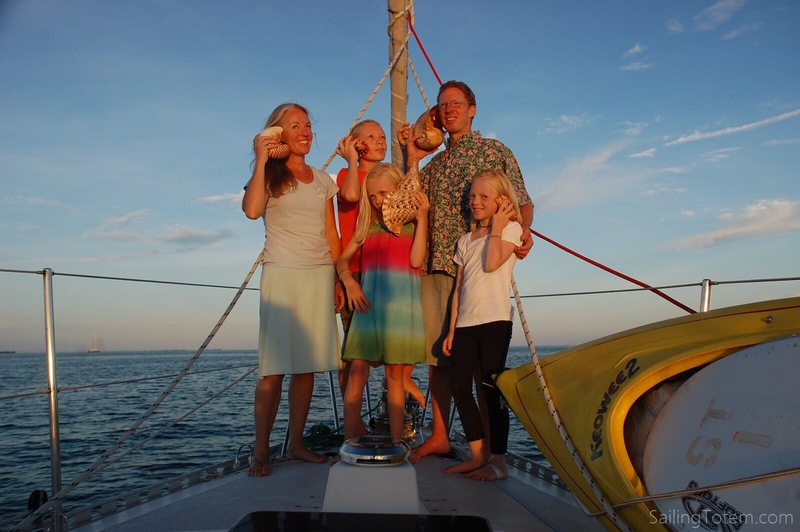 We’ve been following the adventures of this sailing family for several years now – I believe they were just leaving the Western Pacific when I first learned of their blog. Since that time, we have watched them gradually working their way around the world, raising their three children as they explored the depths of each stop along the way. A word about those “depths”. There are many ways to cruise aboard a boat, but it seems to me that it can all be reduced to something I’d call “depth of experience” – that is, the degree to which a cruiser dives into the locale in which they find themselves each day. Many cruisers seem to skim. They arrive, stay a day or two, walk the beach or the Main Street of town, and then declare that they have “done” that stop. Be it St. Augustine or Brisbane, they arrive, refuel and re-provision, check out the t-shirt shops and a restaurant, and they’re off to the next. Conversely, there are folks who immerse. Cruisers who arrive, take a breath, and then dive – head-first and (figuratively) naked – into the unknowns and opportunities before them, ready to be overtaken and re-made by this new and alien culture and landscape in which they’ve landed. 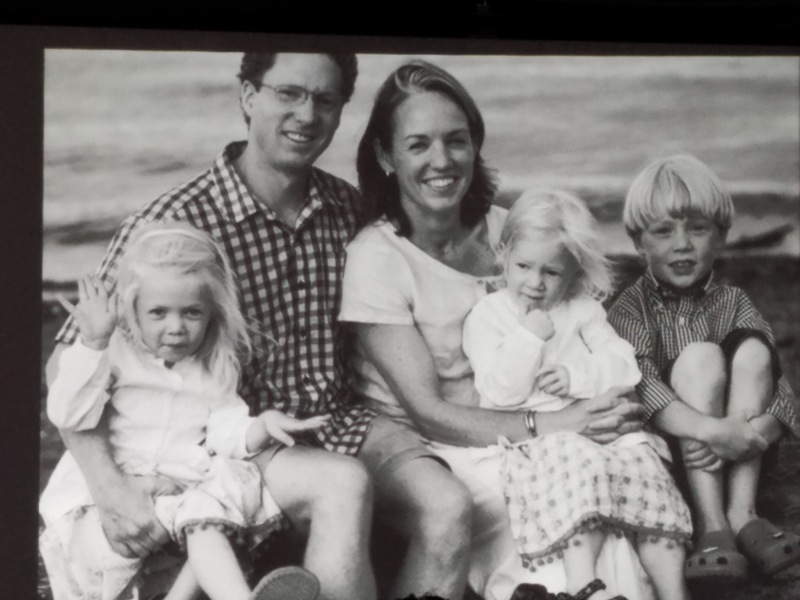 And that last perfectly describes the Gifford family and their eight-year (and continuing!) journey. state, they’ve made several stops to give seminars and visit with cruisers and wanna-be’s from Connecticut to Miami. 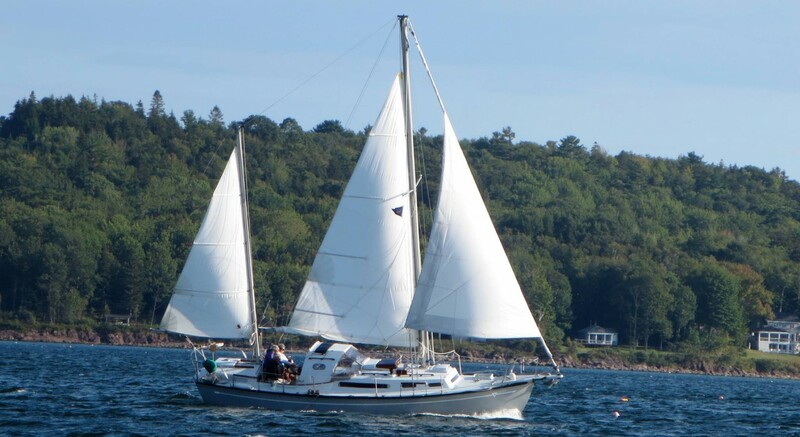 We had hoped last year that we might entice them to the Seven Seas Cruising Association Penobscot Bay Gam, which Nicki and I organize in Rockland each July, but they weren’t able to make it that far north. 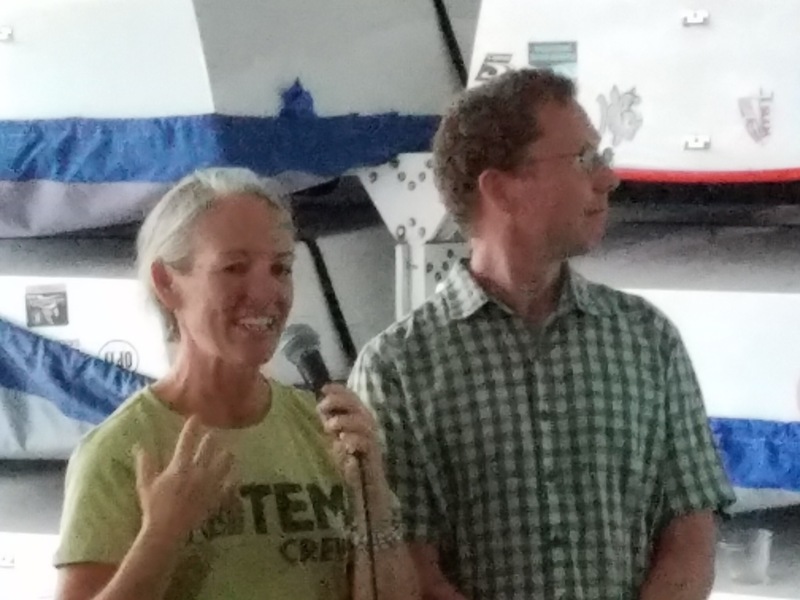 We kept track of them, though, and when new friends Dan & Jaye from s/v Cinderella here in Marathon invited us to take a road trip to Miami to hear them speak, well… I couldn’t say “Yes!” fast enough! But we’ve learned so much from the writings of Behan and Jamie that it hardly matters. There is a cruising attitude that makes all the difference between being a tourist versus becoming a participant, and the Totem crew has perfected it. I can’t claim that we on Sionna have consistently managed the latter, but I do know that their example has helped. They have made us better cruisers, better citizens of the water, better emissaries of the cruising world, and – undoubtably – better people. So here’s a doff of the hat and a blast of the conch horn to Behan, Jamie, Niall, Mairen and Siobhan. We may not follow directly in your wake, but we do try to follow in your footsteps. Your love, care and generosity are an inspiration to many, many people, and for that, you may be proud. 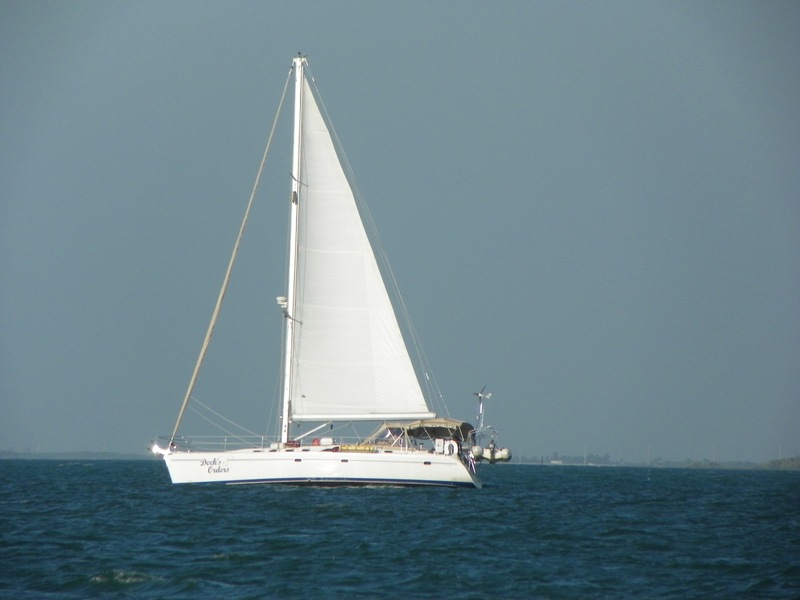 Categories: Attitude, Cruising, Cruising Philosophy, Living aboard, Social | Tags: Sailing Totem | Permalink. We’ve heard this question, in one form or another, several times since we started out on this little adventure. Actually we started hearing it before we started out, back when we were still planning and dreaming. And the truth of the matter is that we can’t. Not that we haven’t managed to make it happen, but it isn’t like we’re just blithely rolling along, never a worry or care about money. We’re scrimping and saving and giving up things like a permanent land-home (sold the house and gave up the lease on our rental), and we’ve not been able to do many of the restaurants, museums, tours and sights we’d once hoped to enjoy. Those things all cost money, and with all my medical B.S. this last year, money is scarce. Read about The Eye Thing Here. So when we got an email a couple weeks ago from a friend back in Maine, asking if we were interested in picking up a little extra cash, it didn’t take too long for Nicki to say “Well yeah!”, and for me (who lives in a constant state of financial denial) to be convinced that we should take the opportunity presented. 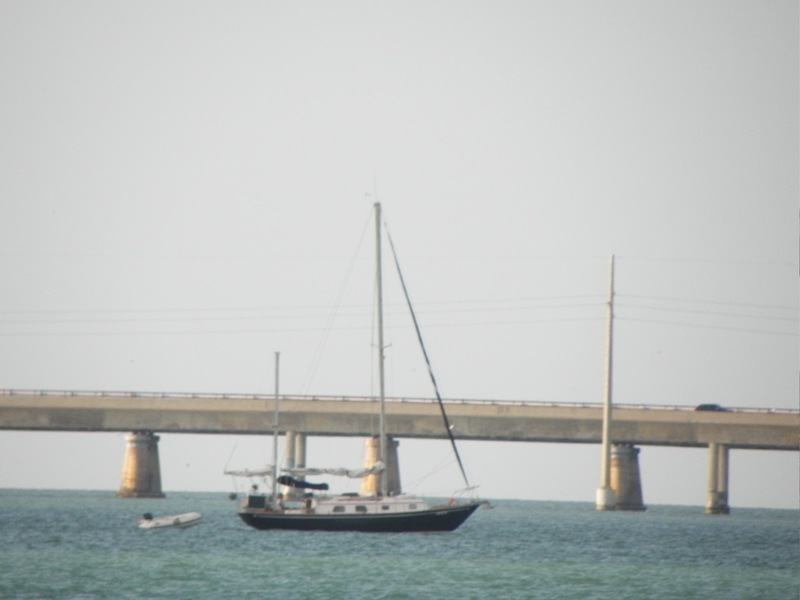 So with Sionna safely tied to a mooring in Marathon and watched over by friends and fellow cruisers, we rented a car and drove the 7 hours from the Keys to St. Petersburg Florida. 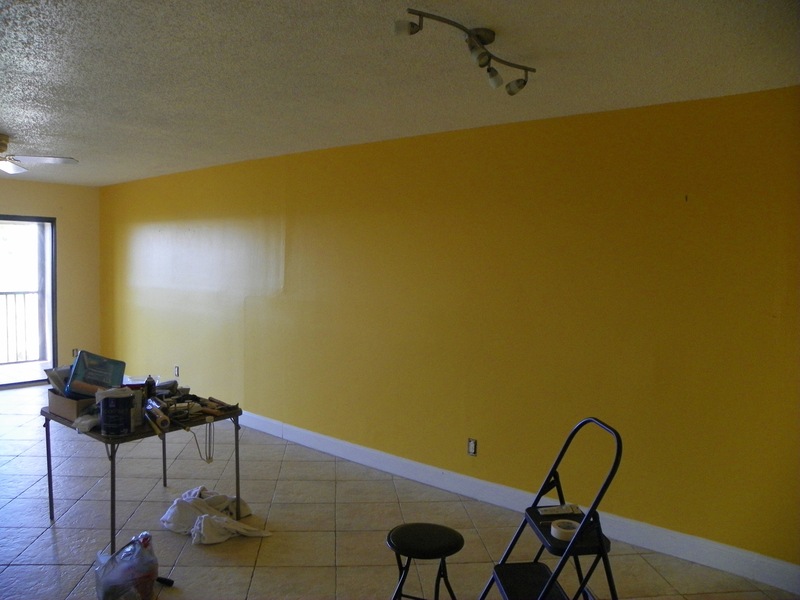 There, a friend we’d worked for back in Rockland had just purchased a condo that desperately needed some sprucing up – and we became her helpers. 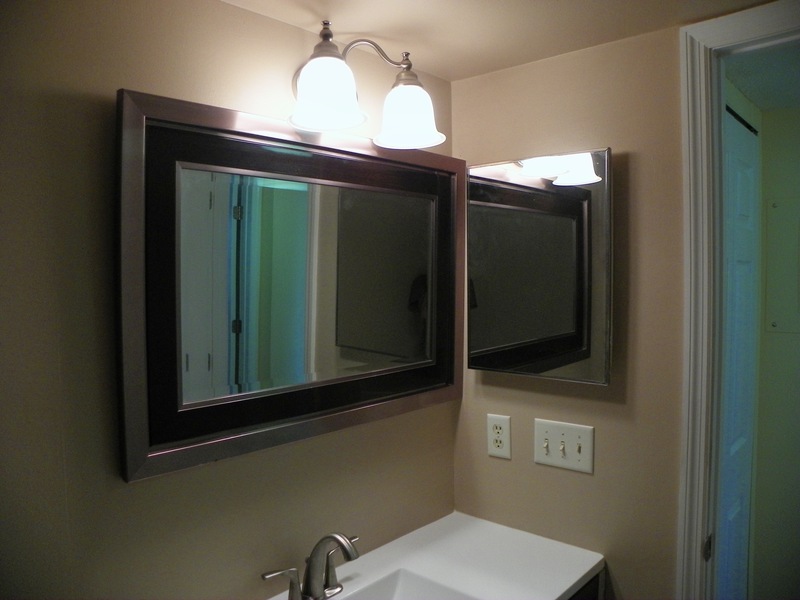 Repair and paint three rooms, replace all the switch plates and outlet covers, replace both bathroom light fixtures, adjust numerous closet doors, install kitchen cabinet knobs, replace the fridge water filter, repair the ice maker…. The list gets longer as you work, much as it does for a boat. 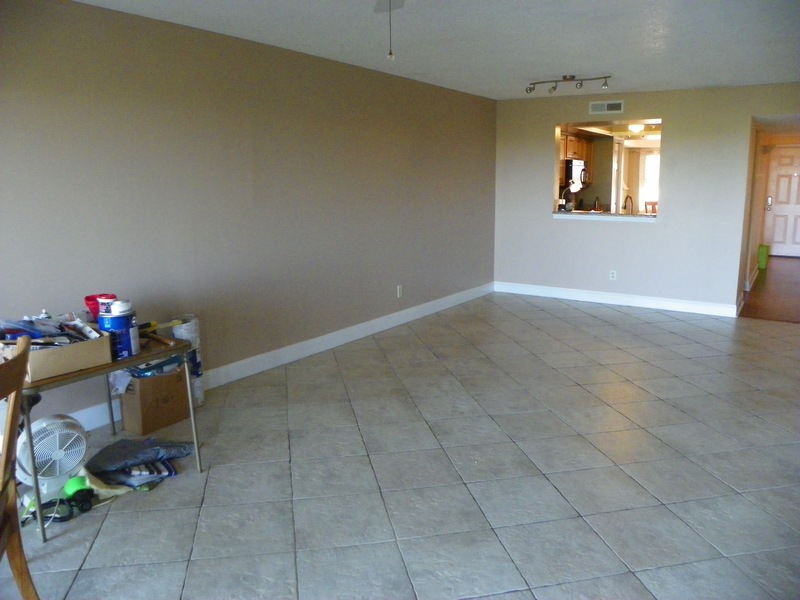 Unlike boats, however, in a house you do reach a point where you can say you’re “done”. The before shot – quite a color! So that’s been our last week. But not constantly working, no. We also fit in some family visits (Nicki’s brother and family were down for several days from Vermont), as well as a get-together with Lisa & Tim, a Facebook-friend couple we’d not seen in person before. Turns out they’re neat people, and she makes very decent homemade wine – and shares it too! Plus they have two aging but very sweet bulldogs, so we got a little “doggy-time”, too. AND we made almost enough cash on this job to put the boat in storage for the summer! Categories: budget minded, Cruising, Frugality | Permalink. Hard to believe, given how generally hard-core I am about sailing, but it had been over a month – since January 24th – of hanging at anchor and chillin’ to the island grove, not moving a muscle toward giving Sionna some exercise. Yes, I’d sailed the dinghy around the harbor a few times, but the big boat just sat, collecting moss. So yesterday we decided to take part in what the harbor calls “Sail-away Sunday”. It’s just an encouragement to get people to drop the mooring now and then, and use their boats (power or sail) for their primary purpose – movement. We chose to head over to a local landmark called Sombrero Light. It’s about 5 miles southwest of Marathon, and it’s tall enough (142′) to be clearly visible from there. Visible, but you don’t get a feel for how big it actually is until you sail around it – which of course is what we did! Smiles are a good sign when you’re sailing – it means you must be doing something right! I wanted to anchor out for the night. No neighbors (or at least no close neighbors), no generators running, no bright lights from the ball field by the marina, no traffic. And Nicki, bless her heart, fell for it. 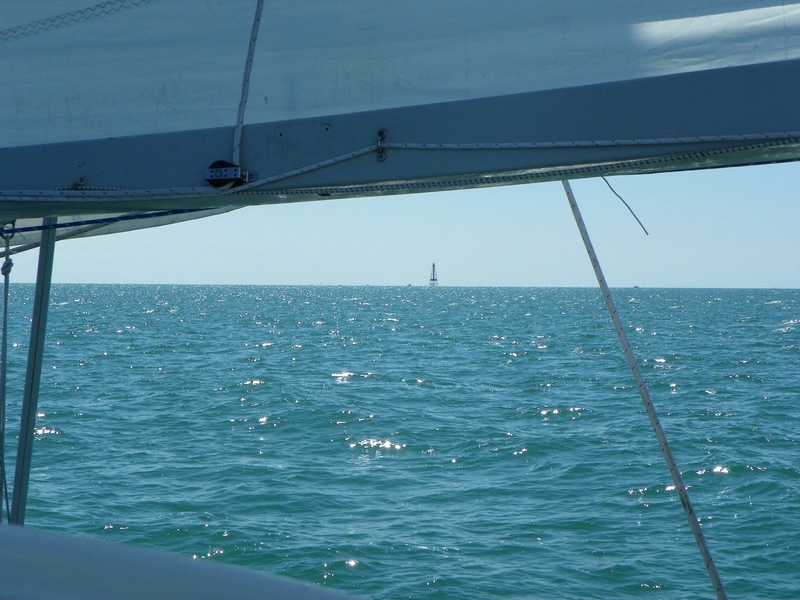 Not only that, but just for fun instead of dousing sail and motoring in to anchor, we sailed in, furled the Genny (our headsail), headed into the wind and coasted to a stop. 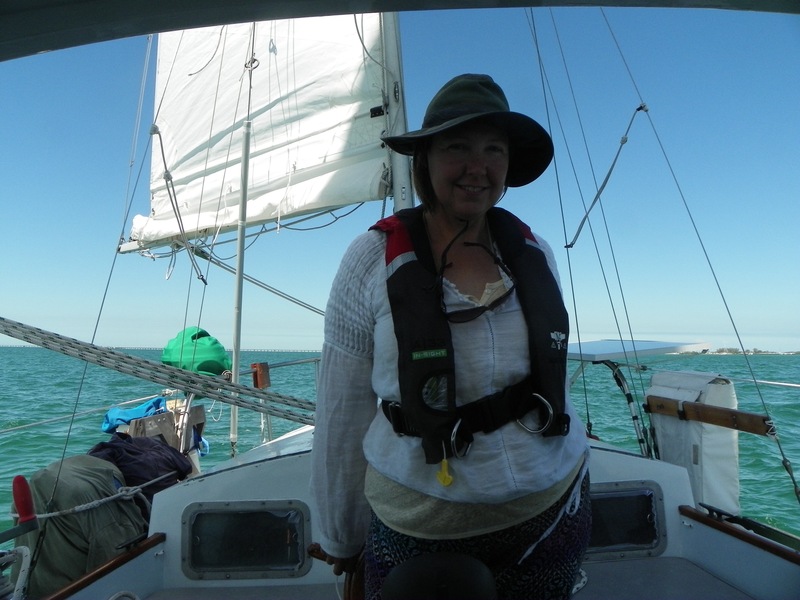 Nicki let the anchor go and ran the chain, while I got the mainsail down and out of the way, all in near silence, while the couple other boats in the anchorage looked on in shock, amazed to see a sailboat actually being operated like a sail-powered boat… Glorious! And the payoff? Well a sunset, of course! 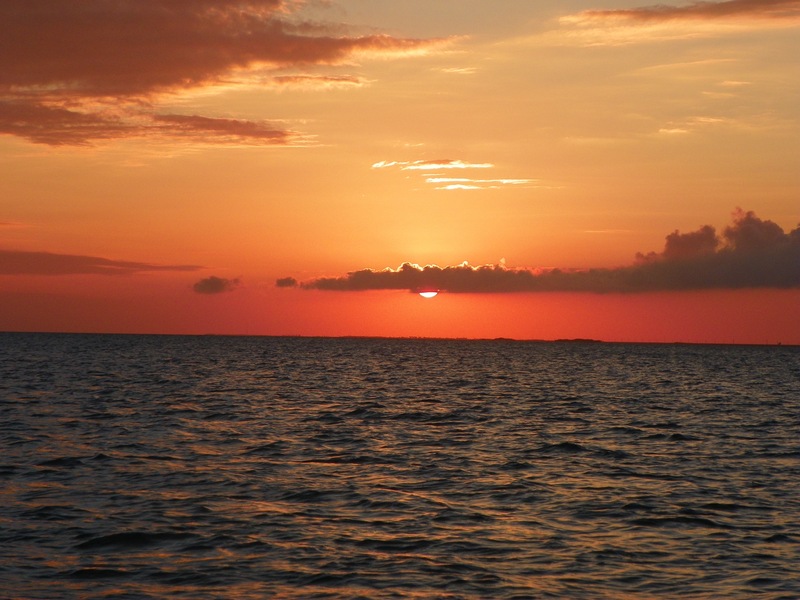 I’m not quite sure why, but there is nothing like a sunset over the sea to put your mind at ease. We’ve seen a bunch, but it never gets old. So the wind picked up a bit overnight, but it was from the east so our ride at anchor stayed pretty easy, and it sure felt good to feel the boat moving to the water again. I slept better than I have in a while, Nicki, not quite so good, but perhaps we just need to experience it more often? That’s the story I’m going with. And the cream on that? This morning we had the chance to welcome an old friend into the harbor, and wish fair winds to new ones. “Dock’s Orders” (Here’s a link too their blog) has been in Marathon for 8 weeks, but they have finally escaped for some time cruising the west coast of Florida. We followed Brad and Sandy all the way down the ICW from Hampton, VA last fall, and though we didn’t get to spend as much time visiting with them as we’d hoped (where did the time go?) we know we’ll see them again. It’s a small world, cruising. You really never know when you’ll bump into someone you know, or met 1000 miles (or 10,000 miles!) ago. And that’s a big part of the charm.